“Jarengeleden begon ik aan m’n reis op de tractor en waar ik kwam vroeg ik mensen naar hun droom. Ik vroeg ze om ze op een klein papiertje te schrijven of te tekenen. Overal waar ik kwam nam ik al die dromen met me mee, achterop mijn tractor. En ik beloofde om ze mee te nemen naar het puntje van de Zuidpool. Het is belangrijk om dromen te hebben, maar misschien nog wel belangrijker om voorbeelden te hebben dat dromen uit kunnen komen. Het heeft me 12 jaar gekost, maar ik ben zo blij om hier te zijn, met al deze dromen en ik hoop dat velen al zijn uitgekomen. 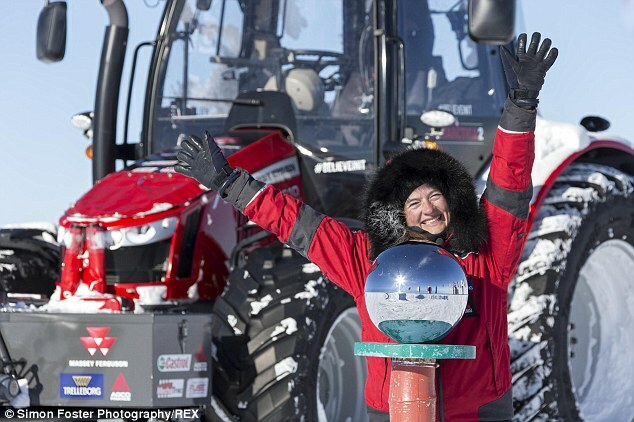 This entry was posted in Blog and tagged dromen, expeditie, South Pole on 14/12/2014 by Tractor Girl. 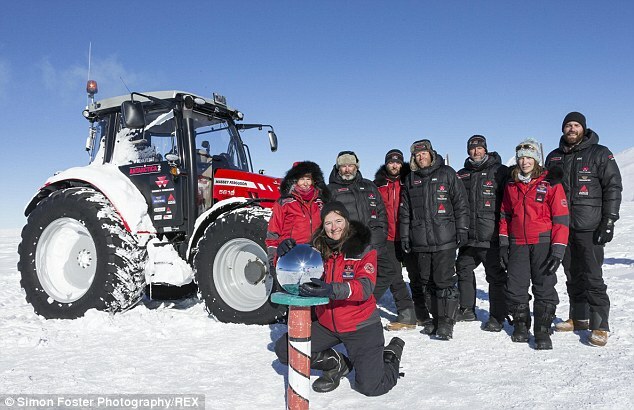 This entry was posted in Blog and tagged expeditie, South Pole on 09/12/2014 by Tractor Girl. 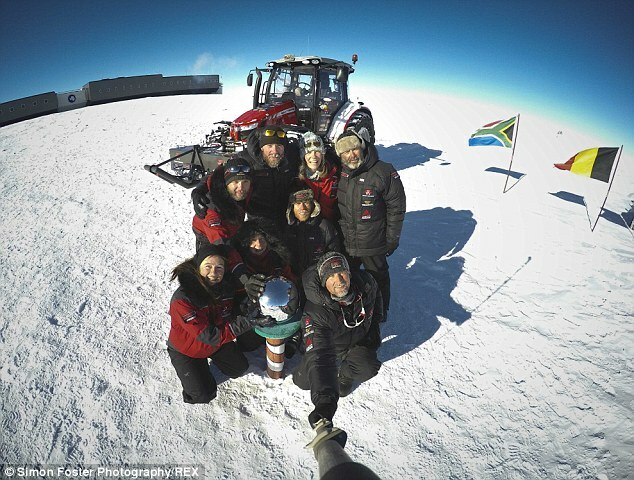 Dutch actress and adventurer Manon Ossevoort arrived at the South Pole on Tuesday after chugging along on a tractor from Europe through Africa and across the frozen wastes of Antarctica. The globe-trotting new mother of a 10-month-old baby said the the 16-day, 1,500 mile trip across the largest single mass of ice on earth from Russia’s Novo base to the Pole had been tough. Driving the huge red Massey Ferguson tractor over the rugged, icy landscape at an average speed of about 6mph an hour was ‘like rodeo riding’. ‘It’s quite emotional, I’m very happy,’ Ossevoort told AFP by satellite telephone shortly after arriving at the Pole and fulfilling a decade-long dream. Ossevoort said the worst part of the trip was ‘the day that I was driving for hours and hours and could not go faster than between 0.5 and 3mph’. Ossevoort began her trip in 2005, taking four years to drive from her home village in the Netherlands to Cape Town at the southern tip of Africa – and then missed the boat that was due to take her to Antarctica for the final leg due to delays. Frustrated, the former theatre actress spent the next four years back in the Netherlands, writing a book, working as a motivational speaker and desperately trying to get back on a tractor. 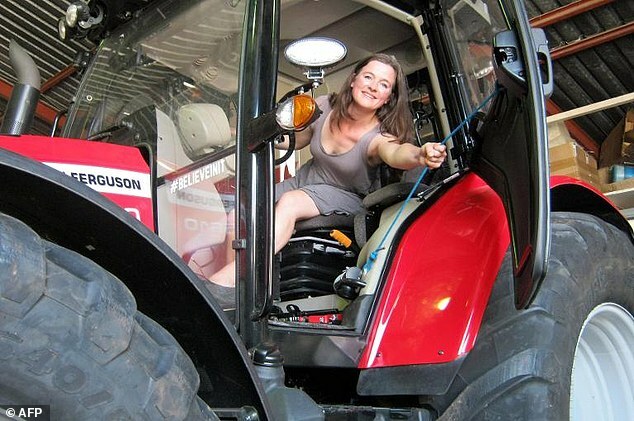 With sponsorship from Massey-Ferguson and other companies, she finally made it. Ossevoort travelled alone through Africa, but in Antarctica the tractor needed to creep forward day and night, so French mechanic Nicolas Bachelet shared the driving. In total, she was accompanied by a team of seven, including crew who are filming the journey for a documentary. She now plans to write a children’s book and produce the movie of her journey. After a day’s rest at the South Pole, the Antarctica 2 team will embark on the return journey to Novo Runway on the Antarctic coast. Ossevoort’s daughter, Hannah, has been in the care of her partner, airline pilot Roger Nieuwendyk. 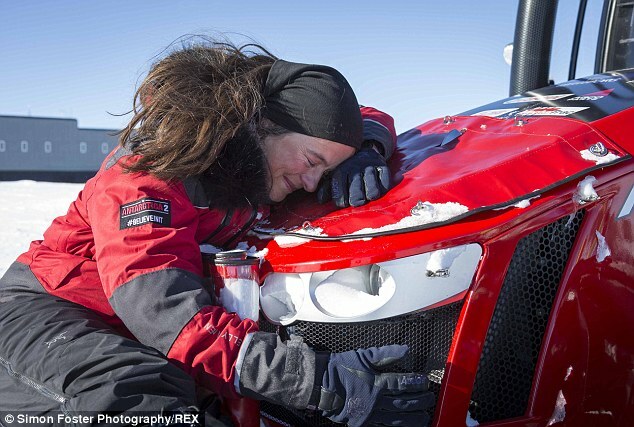 Cradling the baby in a tractor shed in Cape Town as Ossevoort made final checks before leaving for Antarctica, he told AFP she had his full support. ‘We’ll be there to meet her at the airport when she comes home,’ he said. 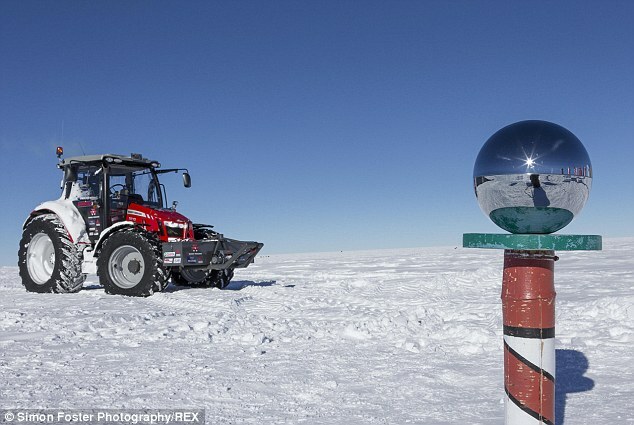 Ossevoort’s tractor is named Antarctica 2 in honour of legendary explorer Sir Edmund Hillary, who travelled to the South Pole on a tractor in 1958. His vehicle was equipped with full tracks, however, while Ossevoort’s has normal inflatable tyres which have been slightly modified for better grip on the snow and ice. While fulfilling her own long-held dream, Ossevoort carried with her thousands of ‘dreams’ collected from people in Africa and around the world. Scraps of paper and emails have been converted into digital form and will be placed in the belly of a big snowman she will build at the pole — to be opened only in 80 years time. ‘I want to turn them into a beautiful time capsule of the dreams of the world so that in the future children and people can read something about our dreams and not only about politics or war,’ she said. Fear holds people back from pursuing their dreams, she says, and many believe that ‘putting them into reality is as impossible as driving a tractor to the South Pole’.